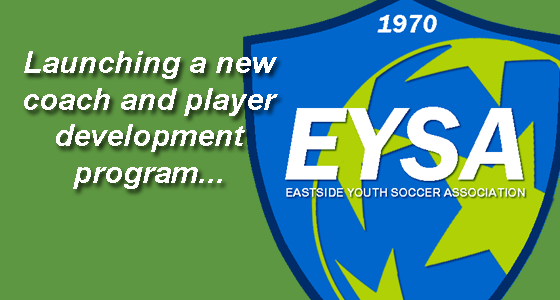 (Aug 12, 2016) Sounders FC and EYSA (Eastside Youth Soccer Association) today announced a new first-of-its-kind coach and player development program to support recreational youth teams and coaches. The program, which will debut in beta form for the upcoming fall 2016 recreational season, aims to provide the five EYSA recreational clubs (Bellevue United FC, Issaquah FC, Lake Hills Soccer Club, Mercer Island FC and Newport FC) with enhanced and cutting-edge plans and systems for coach development support, player development curriculum, playing philosophy, player development programs (already offered by Sounders Youth Development Camps) and weekly technical direction (to be provided by Sounders-trained Technical Directors). This program has been under discussion for the past year and aims to replicate some of the large successes of Mercer Island FC which has produced many players from its recreational programming who went on to play in the Sounders Academy or other elite programming like Elite Player Development/US National Team pools, and top level Regional Club teams, such as Eastside FC, which is the premier club, and sixth member club of EYSA. Eastside FC is an official youth partner of Sounders FC. "We believe there is a substantial opportunity in providing education and resources to youth players and coaches," said Sounders FC Academy Director Marc Nicholls. "This is a previously unsupported frontier that has the potential to substantially accelerate and enhance the youth soccer product --- we aspire to a high level of efficiency in the way we improve the development of youth coaches and, even more importantly, players." The new program will provide coaches with a weekly session plan, videos and coaching development topics. There will also be free coaches' education clinics (available to EYSA rec coaches) that will support and educate coaches on the upcoming season's session plans, playing philosophy and suggested tactical references. "With 80% of our country's players playing in this youth and rec demographic, there is an enormous opportunity to better develop players. One need only look at a country like Iceland, where they can develop competitive global teams with a population size of 340,000 people. Or, on a much smaller scale, Mercer Island with only 20,000 people, to realize that there is so much room to raise the bar," said EYSA Technical Director Aaron Byers. "This program is all about continuing to get better, raising the bar, and never stopping the soccer learning process." For more information about EYSA coaching and curriculum programs, click here. A non-profit serving over 8000 youth soccer players in the Eastside of Seattle, EYSA is a member of Washington Youth Soccer, the governing body of soccer in Washington state, and supports its mission to foster youth through soccer at all ages and levels of competition. EYSA is dedicated to providing soccer playing opportunities for kids ages 5-19, at the level they choose to play, from recreational to premier, and levels in-between. EYSA and its programs support young soccer players, their families, referees, coaches and their teams involved in youth soccer in the communities of Bellevue, Issaquah and Mercer Island.